Summary: Keeping competitive with benefits packages is an important focus for community banks, as wooing top talent can be particularly challenging. See how the new tax law is allowing many banks to beef up their benefits. According to creditcards.com, as many as 12mm Americans have admitted that they hide money from their significant others. We are not exactly sure the motivation for doing this, but experts say this is not a good thing as it builds distrust. 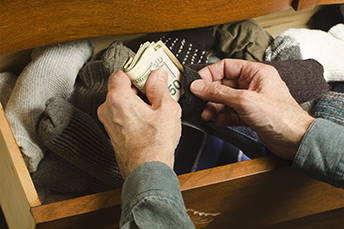 These days, it is not as easy as hiding a wad of cash in your sock drawer either. In our high tech, data rich world, it is about as easy as a P2P text message or mobile deposit notification to find out about any extra money being kept by your partner. On the flip side, many companies seem motivated to share extra money with their employees after the recent tax cut. The new tax law, which slashed the corporate tax rate to 21%, from 35%, has afforded employers an opportunity to pass on some savings to workers. A recent report from Willis Towers Watson found that nearly 50% of respondents are considering making a change to at least one employee benefit program as a result of the tax reform. To be sure, these types of moves are understandable given that evidence shows employee benefits are becoming an increasingly important factor in retaining and motivating existing employees, as well as attracting new ones. Keeping competitive with benefits packages is an important focus for community banks, as wooing top talent can be particularly challenging. If your bank is ruminating about ways to potentially change your benefits programs, it may help to consider what other banks have done. Here, the ABA has produced an ongoing list of publicly announced efforts by banks. A majority of employers are planning or considering taking action on broad-based compensation programs, or have already taken action, according to Willis Towers. This could include a change to a company's compensation philosophy, addressing pay-gap issues, or a one-time bonus payout, for example. Another survey by Pearl Meyer found that among companies that have already made changes to their benefits, the most common shift was a bonus to employees. At that point, more than 50% of respondents were providing a $1k bonus. Of course, it is important to also note that these 1x bonuses in many cases were given to staff that normally does not qualify for bonus programs, so banks must balance the approach. Yet another possibility is to increase the minimum wage for workers perhaps. Some banks have boosted hourly wages to $15 per hour even. Still other banks are exploring expanding their personal financial planning offerings, increasing 401(k) contributions and increasing or accelerating pension plan contributions. Other potential areas Willis Towers identifies include increasing the employer health care subsidy, reducing or holding flat the employee payroll deduction, or adding a new paid family leave program in accordance with the Family Medical and Leave Act. Most assuredly, when it comes to upping the ante in employee benefits, there are many potential avenues and options to explore. As your bank goes down this road along with the rest of the industry, it is nice to know at least that tax reform has given banks an opportunity to not only assist employees, but also delight them. Hopefully, we have given you some food for thought in your own bank with these ideas. The Wall Street Journal reported that the Justice Department is expanding its scrutiny of Wells Fargo from the retail area to its wealth management business. It is examining fee calculations within certain fiduciary and custody accounts. The wealth and investment division brings in 10% of all bank profits. 1) Evansville Teachers Federal Credit Union ($1.5B, IN) will acquire American Founders Bank ($113mm, IN) for an undisclosed amount. 2) Morton Community Bank ($3.5B, IL) will acquire State Bank of Speer ($183mm, IL) for an undisclosed sum. The Court of Appeals for the District of Columbia Circuit has ruled banks are exempt from an FCC regulation that limits robocalls. The court said banks and healthcare companies can use robocalls to provide vital and timely information as needed for customers. Accenture research of 30 mobile banking apps finds all of them had at least 1 security failing. According to an Instamotor survey, the most common bills that full-time working millennials get payment assistance from parents are: cell phone bills (53%), car insurance (31%), car payment (30%), utilities (30%), rent/mortgage (27%), health insurance (18%), student loans (18%), credit card (17%) and other (5%). A GOBankingRates survey finds people say they have active accounts with the following number of banks: 1 bank (50%), 2 (28%), 3 (11%), 4 (4%), 5 or more (7%).